Klim’s sizing chart is listed below. For street riding jackets, the size chart is pretty close, but for their jackets primarily for off-road use like this Dakar, the actual measured sizes of the jackets are roomy compared to the chart. For that reason, I recommend you buy the size you wear in men’s clothing, and consider the sizing chart to be a secondary reference rather than a chart that indicates the actual measurement of the jacket. There should be plenty of room in this jacket to install all the optional armor without up-sizing. The Klim Dakar jacket for 2019 is a durable and vented textile shell with an easy-to-wear fit aimed at off-road and adventure-riding motorcyclists. The jacket is made to accept optional armor from D3O. The 2019 Klim Dakar jacket is a lighter, simpler shell as compared to their more fully kitted jackets for street use. The shell of this jacket made from a durable textile material with reinforced materials on the shoulders and elbows. It fits relatively loosely so you’ll be able to move very easily and the overall weight is reduced. 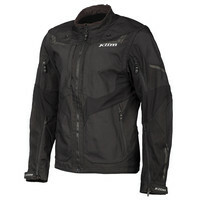 Unlike many Klim jackets, this one is NOT waterproof construction. For summer use, there are zip vents on the lower and upper sleeves and there are two zip-vents on the lower rear area, so with all the vents open, you’ll get a lot of air flow through the jacket. Also, this jacket has the unique feature of removable sleeves. There are two circular zippers right at the shoulders, so you can just take them off. The shoulder and elbow pockets for armor are attached to the sleeves, so if you go sleeveless, you’ll be without. From a safety perspective, I’ve always been puzzled by the removable sleeve idea, but I’m not an off road rider either. Maybe there are situations where you’d like to be free of those sleeves, or maybe you want to wear the vest part after the ride… maybe somebody will let me know how they’d use the sleeveless feature. Speaking of armor, the aforementioned pockets are set up to accept Klim’s D3O armor. The armor is soft and comfortable so it is easy to wear. You can buy armor for the shoulder, elbows and back. Take the links below to buy. For 2019, Klim is offering collar hold-back tabs for each of the collar tips. You just lower the from main zipper some and then use the little elastic loop just inside the collar tips to hook the plastic piece on the shoulder. That way the collar is held open and you can catch a lot of extra air. Klim says: Engineered to dominate the most challenging multi-season off-road/dual-sport conditions where performance is critical. Updated with a streamlined fit and more ventilated design, the Dakar is the ultimate off-road/dual-sport jacket for demanding rides.